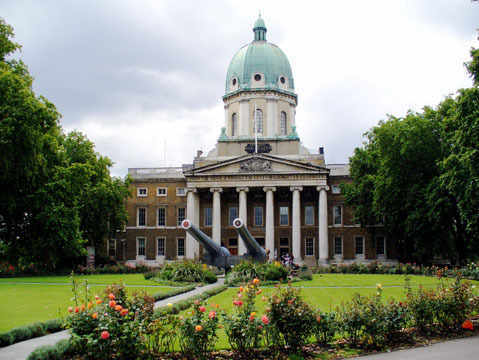 The Imperial War Museum is a British national museum organisation with branches at five locations in England, three of which are in London. The museum was founded during the First World War in 1917 and intended as a record of the war effort and sacrifice of Britain and her Empire. Today the museum gives its mission as 'to enable people to have an informed understanding of modern war and its impact on individuals and society'. The museum's collections include archives of personal and official documents, photographs, film and video material, and oral history recordings; an extensive library, a large art collection, and examples of military vehicles and aircraft, equipment and other artefacts. The museum is funded by government grants, charitable donations and revenue generation through commercial activity such as retailing, licensing, and publishing. Admission is free to Imperial War Museum London and Imperial War Museum North, but an admission fee is levied at the other branches. The museum is an exempt charity under the Charities Act 1993 and a non-departmental public body under the Department for Culture, Media and Sport. The current Chairman of the Trustees is Air Chief Marshal Sir Peter Squire. Since October 2008, the museum's Director General has been Diane Lees. Limited meter parking on Lambeth Road. Please note: the Imperial War Museum London is situated inside the London Congestion Charge zone. Driving within the zone will incur a daily charge of £8.00. Please see www.cclondon.com for further details on how to pay the charge. See the Sustrans website on www.sustrans.org.uk/ for further information on London Cycle Routes. IWM London is situated near the Thames Path, one of London's key strategic routes connecting more than a hundred attractions including more than 30 museums, a dozen parks and gardens, 21 historic monuments and 7 art galleries. See the Thames Path London website on www.walklondon.org.uk/ for more details.